It’s the time of year for giving thanks – and we want to say a big “thank you” to all of the fantastic leaders in our local nonprofit sector! This week’s “Spotlight” is from the Young Nonprofit Professionals Network RVA (YNPN RVA). 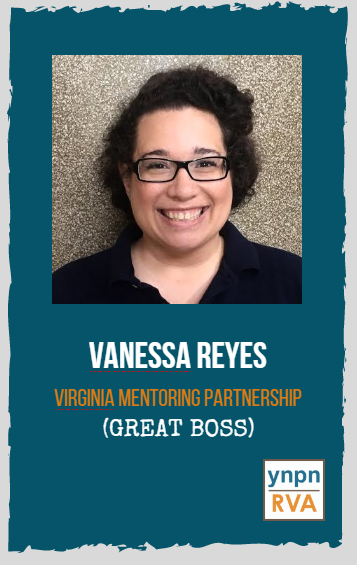 Over the past several weeks, YNPN RVA sent out a call to young nonprofit professionals all over Greater Richmond to nominate their boss to be recognized as a part of the “Great Nonprofit Bosses” Initiative. In total, 37 bosses were nominated by 57 different young nonprofit professionals; from that group, a YNPN RVA panel selected the top 9 outstanding and compelling nominations. 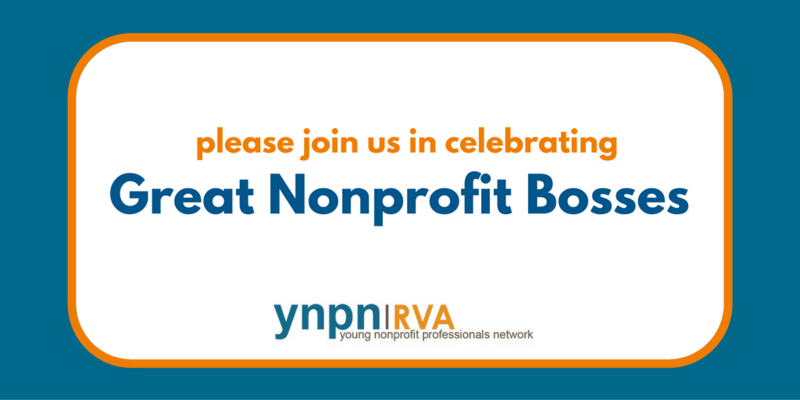 You can get even more insight from our local great nonprofit bosses on November 30th at the YNPN RVA celebration at Postbellum – register here. 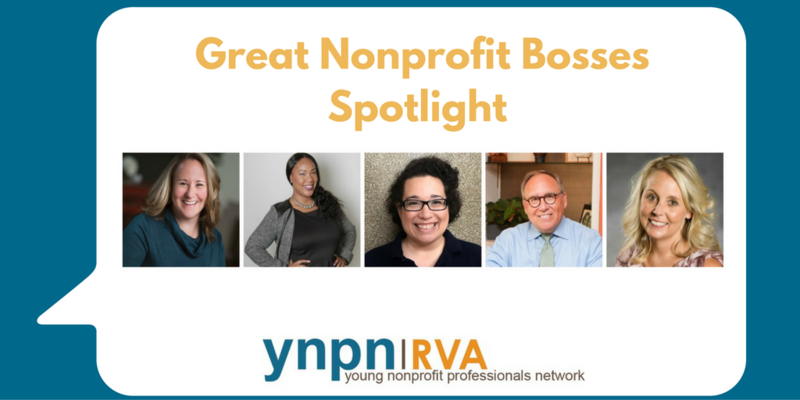 You can also read part 1 of YNPN RVA’s Spotlight on Great Nonprofit Bosses. Q. What’s one quality you have that makes you a great boss? I believe empathy is the one quality that makes me a great boss. I believe empathy is the complement to honesty/trust and when there is empathy and trust it’s so much easier to build great working relationships. Q. What do you look for in a person in a leadership position? The first thing I look for in a person in a leadership position is creativity. During interviews one of my favorite questions to ask is “how would you change our current way of doing things?” and I love studying how creative leaders lead their organizations during periods of change. 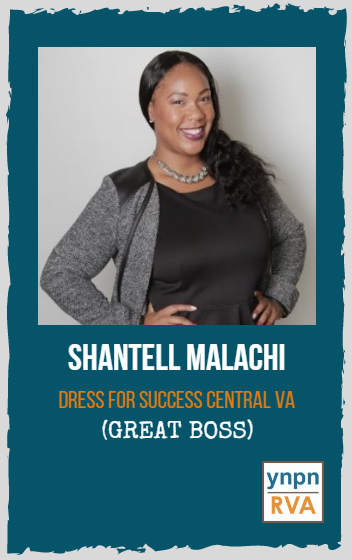 As the Executive Director of Dress for Success Central Virginia, Shantell has made it her personal mission to move the women we serve forward in life and in work. That mission extends to her staff. She motivates us daily to pursue our passions and walk in our purpose. She is selfless and humble. It is so refreshing to know that when I have a problem, whether personal or professional, that I have a boss that is willing to listen, offer honest advice, and help me follow through with my decisions. She gets more joy out of seeing others succeed than I think she ever will for herself. Watching her interact with our clients is like watching a big sister help a little sister. Most clients don’t even know that she’s the boss until someone else tells them. There isn’t any job in the office that she won’t do… even cleaning the bathroom! Shantell has grown Dress for Success so much in 5 years that it’s hard to imagine that just a few short years ago we were operating out of a basement and her garage. When staff and even our Board could not see the big picture she never lost her enthusiasm and went above and beyond to motivate us to strive for greater. Her drive is infectious! Q.What’s one quality you have that makes you a great boss? This is a funny question. I don’t know that I’d say I am a great boss (I’d say I work hard to listen and be present with the staff) but since you are asking and my staff seems to think so I’d say the following…. I listen and respond to the unique needs and interests of the members of my staff. I also treat them how I’d like to be treated. I believe that if I nurture their unique interests (work-related and beyond) that they will be happy, do a great job and want to come to work each day. I look for honesty and kindness, a willingness to teach and learn, and a willingness to try new things. I also look for common sense and compassion. I believe that we can all learn from each other and have the capacity to lead from anywhere we sit within an organization. Amanda operates with a great deal of trust in all of her supervisees and teammates. She fully realizes that she cannot do it all herself, and she advocates for the capacity that the team and organization needs to strategically move forward. Not only that, but she respects each of her supervisees and teammates for their unique talents and areas of expertise, and relies on this, rather than micromanagement or hovering, to supervise. 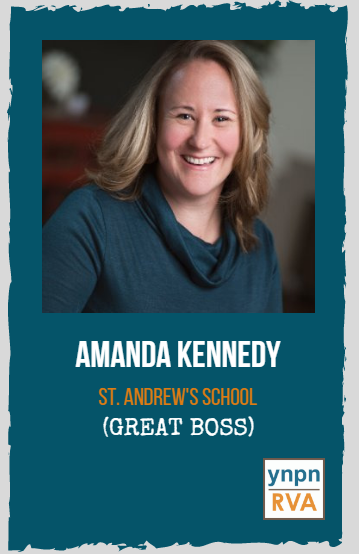 Amanda believes in constant learning and improvement and supports each of her supervisees by providing a generous professional development budget and the time to go out and use it. Additionally, she highly values work-life balance and encourages all of her supervisees to manage their own time. She is a model of what it means to build a high performing, autonomous team. Flexibility. I believe my team will always do their best so I give the freedom to succeed. For me, work ethic is key for successful leaders. Leaders should be an example for their team to follow. Melanie is an exceptional leader. She advocates for her team, doing the best she can to send us to conferences, helping us to grow in our roles (or to change roles if it’s in our best interest) and standing up for us when necessary. Melanie trusts us to make good choices as subject matter experts rather than micromanaging us. She inspires creativity and doesn’t discourage us from questioning the reason or way things are done. Melanie respects work/life balance, encourages us to take time away from the office and truly cares about her team on a personal level. She treats us as family, regularly organizing outside-of-work events, team lunches, birthday celebrations and more. Melanie communicates openly and honestly with a positive outlook. What’s more, she is truly wonderful at what she does. I have the utmost respect for how great she is at her job and how much she can handle while simultaneously being an excellent manager. She is always willing to help. Before I worked for her, I wanted to. And now that I do, I would be happy to have her as my boss for the long haul. Vanessa is one of the best supervisors I’ve ever worked with. Every meeting with her involves active listening, collaborative working, and respect. I feel valued in every project I work with her on. She actively considers my professional development and work-life balance through open and honest conversation and sharing of resources. She adapts well to challenges and is flexible with changing our approaches to difficult tasks to foster the most constructive outcomes possible for all involved parties. She empowers me to develop into a stronger leader and more effective communicator. Through her support, I feel more confident in professional skills and optimistic about my ability to achieve future professional development goals. I feel so grateful and fortunate to have the opportunity to work with her. 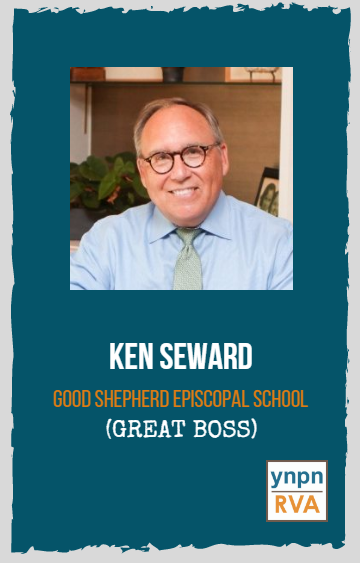 Ken Seward leads and serves the Good Shepherd Episcopal School community. He brings his own creative, innovative ideas, and encourages others to express and share and pursue their interests. Ken works to understand individual children, families, and teachers. He also understands the dynamics within groups and encourages constituents to work together to build consensus. It is a pleasure to work with Mr. Seward.